Taking a family holiday with a child who suffers from eczema can add a further layer of complication to your trip. There is so much to consider, and even more to pack, to keep your child comfortable. A trip to the snowy ski slopes can be even more tricky, as the cold air outside and high heating inside can aggravate eczema symptoms. Despite the difficulties, a ski holiday can be lots of fun and is a great way to make lasting memories with children too. As always, when you are planning a holiday involving a child with eczema, it pays to be super organised and to think ahead about every aspect. Here, we give tips on choosing the right resort, hassle-free travel and what to take with you on the slopes so that you make the most of every day, without further aggravating itchy skin. Despite the difficulties, a ski holiday can be lots of fun and is a great way to make lasting memories with children too. For a healthy, happy break for the whole family, there a few things to consider when planning your ski holiday. Firstly, you should be careful about choosing a destination and think about how you will get there. Whilst you may dream of having the mountains to yourself in a remote chalet in the Italian Dolomites, it might not be the best venue in reality. Somewhere closer to the UK – the French Alps for example – means you have the option to drive. While flying has benefits, it does tend to dry out the skin and aggravate eczema. Plus, you will also be limited to the amount of lotions you can take on the flight. Opting for a ski resort that is within driving distance can give you more freedom to pack everything you need to keep eczema at bay. Also, having a car with you at the resort also gives you the freedom to head out and about during your trip, and you’ll have the means to get to a local pharmacy if you need to. If you do decide to fly, don’t forget to pack some emollient in your hand luggage – you’re usually allowed up to 100ml . Some airlines may allow larger quantities if you have a letter from your child’s doctor but be sure to find out before you set off for the airport. Planes have a low humidity and can dry out skin very, very quickly, so you should be prepared to apply emollient regularly during the flight and make sure your child drinks water frequently to stay hydrated. Once you’ve picked a ski destination and decided on your travel arrangements, there are a few things to look into before choosing your resort. While hotels and ski chalets are a nice treat, they can be difficult to manage from an allergies point of view. You will have a limited choice over the food options, and the times that meals are served. Going self-catering on your ski holiday will give you more freedom to buy and cook for your family’s needs. These self-catering options also tend to have hardwood floors for easy cleaning, which is ideal for kids with dust allergies. 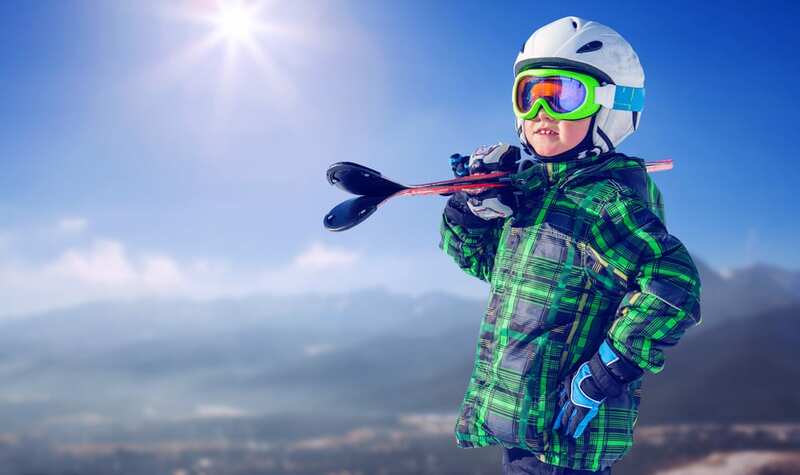 In my experience, it’s a good idea to choose a resort that has at least some gondolas rather than only chairlifts to the slopes, as this will reduce your child’s exposure to the cold and help to keep their eczema under control. A gondola will also give you the chance to organise your children out of the cold, get them warm and dry and apply any emollients and lip salves they might need. Another good tip is to book afternoon ski lessons as the weather will be slightly warmer, making the experience more pleasant as well as being easier on the skin. Consider the clothes you are bringing for your little ones. It is vital to keep them warm, but also try to avoid clothes that are too tight fitting against their skin as it can irritate eczema. Aim for thermals that are made from natural fibres, preferably cotton, to keep eczema under control. If you have to use synthetics, then try them out on your kids before you set off to make sure they aren’t too irritating. Don’t forget to pack your Scratchsleeves scratch mitts and pyjamas too! Bring your own trusted washing powder with you if you are going self-catering, so you can relax knowing your kid’s clothes can be washed safely. Take multiple pairs of gloves and socks and keep some spares in your bag at all times. It is also well worth getting your kids a cotton snood or face cover to protect their faces from the cold weather. When you are skiing, you need to protect yourself from all of the elements, such as the cold and the sun. Bring plenty of sun cream, emollient and moisturiser with you. Sun cream is often very expensive to buy at ski resorts, and you might struggle to find your brand of emollient when abroad. A high lipid moisturiser is essential for the whole family, as the changing temperature will cause the skin to dry out. Plan at least one day off from the slopes. Your whole family will appreciate the rest time, and your child’s skin will need a break from the harsh elements. This doesn’t mean a day wasted on your holiday though; there are usually plenty of indoor things to do nearby as well as enjoy family time with games and hot chocolates too. If you have a go-to product or routine that can help to manage eczema flare-ups, then remember to take what you need when travelling. It is much easier to prevent eczema flare-ups than cure them, and it reduces the stress and discomfort for your child too. Once you have your plan in place, then it is time to enjoy your holiday with your family. After all, you deserve this break too! Do you have any advice to share? If so, head over to our Facebook page or email us at info@scratchsleeves.co.uk.